The duty of the safety-focused employer is to provide safe working conditions for the workforce before, during and after a natural disaster. Employees need the power to check their surroundings to ensure risks are mitigated. Safety-focused employees’ ideas and suggestions need encouragement from the management so employees feel that they can make a difference in the safety of their co-employees. Provide the required levels of education, training, resources, and authority. With the right safety culture in place, employees will take ownership of the safety process. The single most useful source of motivation for an employee is empowerment or ownership of the safety process. Concentrate your training on the principles of a safety-focused culture. Gather suggestions from your employees on how do they want to apply the safety process. You’ll be far better off using this method. It stimulates internal commitment, responsibility and accountability. Performance is always better when energised by engagement versus compliance or obligation. Let’s start asking more questions about how employees want to build their safety system and account for their results instead of telling them what to do. Ask more questions about how your people want to manage safety. Their contribution into safety procedures that affects their safety is critical You can do this through a Safety Action Team. This team is guided by the safety professional and top manager in the company. You need a good reason and a full explanation to your employees to get them on board. Involve employees in problem-solving, safety measurement, workplace inspections, and in safety-focused training. Communicate the results widely and cultivate a culture that values and rewards these efforts. The Emergency Planning Committee’s role is to establish compliance assessment priorities, review and discuss results of the evaluation, then review and resolve any areas of concern in maintaining compliance and preventing accidents. Let your employees report something they have done to enhance workplace safety during the past week or since the last safety meeting. This gives safety prestige and integrates it into the business with the focus on achievement. It also offers people the opportunity to recognise their efforts to keep each other safe. Take a moment to ask for trends, patterns, and overall conclusions such as, “We take care of guards on equipment, but we often miss problems related to the condition of the floor.” People need to be encouraged for being perceptive. Employees need to see that their safety initiatives are working. Take a reliable, realistic position on safety. Express zero tolerance for non-compliance with your work standards and procedures, and provide a method for modifying them. Recognise informally and formally efforts toward compliance. When employees start to notice the beneficial results by eradicating risks, they want to get on board, and you end up with a waiting list of employees ready to participate in emergency and safety committees. When processes, procedures, training programs, operations manuals, supervisory training programs, and management planning sessions all involve the aspects of safety, everyone will become “involved in safety.” It’s not a matter of how to get individuals involved. It’s a matter of implicating safety in the conduct of your overall business. Help others become active about safety based upon them receiving positive benefits. This should go beyond “do this, so you don’t get hurt.” Plan beyond an initial intervention. All involvement should be maintained to build momentum and enhance credibility. A companies Safety vision should get employees inspired about progressing toward excellence in safety. Along with this vision, management should provide opportunities for learning that goes beyond compliance activities or the basics. These learning opportunities should create a high-trust culture. Within this culture, people must be given opportunities to fail as well as succeed, realising that they are being empowered to move toward “their” vision of excellence for safety. Executives, supervisors, employees and the emergency and safety team must have the same vision for the safety of everyone and the business. It has to be an integrated part of your entire operation. No matter how small or large your business is, employees in all fields of industry face workplace dangers that can threaten their health and safety. Establishing an emergency evacuation plan and regularly practising it. Making sure that your organisation has installed and checked adequate functioning protective as well as first response equipment that all employees know how to access and use correctly. Posting appropriate and visible diagrams and signs for best safety practices. Appointing wardens within your organisation to carry out monthly safety checks through the entire workplace and conduct training and drills. Have first aid kits available and accessible within the building. 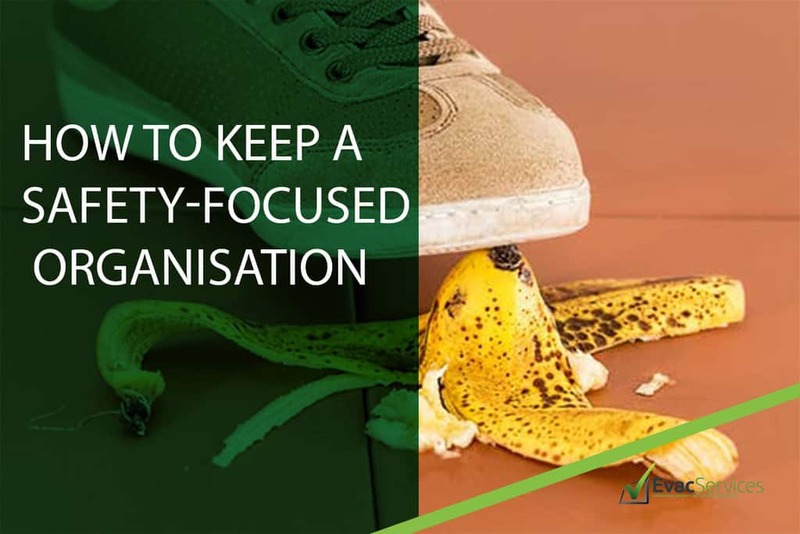 Everyone must understand that safety is important to each level of the organisation and that the employees’ well-being is what it is all about Employees’ concerns and their ideas and suggestions should always be taken seriously, implemented, and rewarded. This is not a difficult mission, but it does take discipline to keep on track and achieve a safety-focused organisation. Do you want to know more tips on how to bring out safety in your organisation? Click a button below, and we’ll get in touch with you shortly!